A very small collection of some of my bookmarks. Some of you spent this past weekend deep in your books, taking part in Dewey's Read-A-Thon. There's always so much enthusiasm around the event--I can't imagine though how any of you get any reading in with all the Twitter chatter, mini challenges, and blog hopping that takes place. Somehow you do it though! I hope those of you who did take part had fun and got in all the reading you hoped to. Although I didn't participate, I did manage to squeeze in some reading time this weekend, finishing off two books, one of which I have been reading for a couple of months. Both were very different books: one a paranormal/urban fantasy novel, The Water Witch by Juliet Dark, and the other being literary fiction, A Teaspoon of Earth and Sea by Dina Nayeri. I hope to spend some time this week writing up reviews. I've actually got a handful of reviews of books I have been reading ready for you. Or at least they're mostly ready to go. They need a good polishing before I post them. In audio, I am listening to Wally Lamb's The Hour I First Believed, narrated by George Guidall. It's over 25 hours long, so it will be a while before I finish it. I'm about four hours into the book, having just finished the chapter where Caelum, the lead character, reminisces about his childhood and his relationship with his father. The book is set around the time of the Columbine school shooting. Caelum's wife, Maureen, was a school nurse, on campus at the time of the shooting. This book is pure fiction, but it deals with the impact such a tragedy has on a person--on a family. At least that's what the book's description says. Really though, the book is about so much more. I most recently started reading D.A. Mashini's mystery, The Missing File, set in Israel. It's still too early to offer up an opinion, but so far so good! Let's not talk about my progress--or lack there of--with War and Peace. I haven't given up, but I have definitely stalled. An opening may not make or break a book, but they are important. Especially for someone like me who needs an instant hook or else I might start looking elsewhere. Across the desk from him sat a mother. Another mother. She was the third he had seen this shift. The first had been too young, and pretty too, with a tight-fitting white T-shirt and wonderful collarbones. She had complained that her son had been beaten up outside the school hard, and he had listened to her patiently, promising that her complaint would be dealt with seriously. The second had demanded that the police send out a detective to follow her daughter and find out why she speaks in whispers on the telephone and locks her bedroom door at night. This sounds like a good one Wendy...I'd keep reading. Feel free to add your link to my post. Thanks so much for joining in. I am enjoying it. I was hoping the munchkin would go to bed at a decent hour last night so I could read a little more, but no such luck. That Wally Lamb book is something. It is like three books in one, which is confusing a little but still amazing. I didn't participate in the readathon either, and usually the spring one is something I can pull off! Blah. Maybe next year. Sandy - I am glad you mentioned Lamb's book being like three in one. I was kind of wondering. The back description for the book seems so . . . limited. Especially since the first few hours of the book haven't had anything to do with the description. But I know Lamb and I know what kind of books he writes. Hopefully next year you can join in on the read-a-thon. :-) I have yet to join in one. Someday . . . I've had the Wally Lamb on my radar for a while - especially on audio, as I love Guidall's narration. I'm in the middle of four different books right now - all different and all good! A Land More Kind Than Home by Wiley Cash; London Falling by Paul Cornell; A Dublin Student Doctor by Patrick Taylor; and Angle of Repose by Wallace Stegner. Carrie - I like the sound of Guidall's voice. Although, I admit I've been listening to the book at a slightly faster pace at times since it is so long, and Guidall takes his time reading. Wow! Four different books! I was there not too long ago. LOL I really want to read London Falling. I hope you enjoy your reading! Interested to hear your thoughts on The Water Witch, I've heard both good and bad about it and would be interested to know what 'made' you take so long reading it (if the time was due to the book, of course). I think I would keep reading the Mishani, I really like that first sentence, full of possibilities for what's happening. Charlie - I really enjoy Juliet Dark's books. It was actually Nayeri's book, A Teaspoon of Earth and Sea which took me awhile to read. I had Water Witch done in a couple of days. Mishani's book is interesting. I am beginning to wonder if it is less a mystery and more of a quiet thriller. The difference for me being whether we know the whodunit up front or not. Not an opening paragraph that would make me want to read more but then again I'm so stubborn that once I begin a book I have to finish it. Loving the picture of your bookmarks, I also have quite a collection as to me turning the corners of a book over is a big no-no. I have to be pretty desperate to turn down a corner. And that means no tissue, no receipts, not paper clips, no pens, no nothing lying around that can substitute. I'd rather remember the page number, frankly. 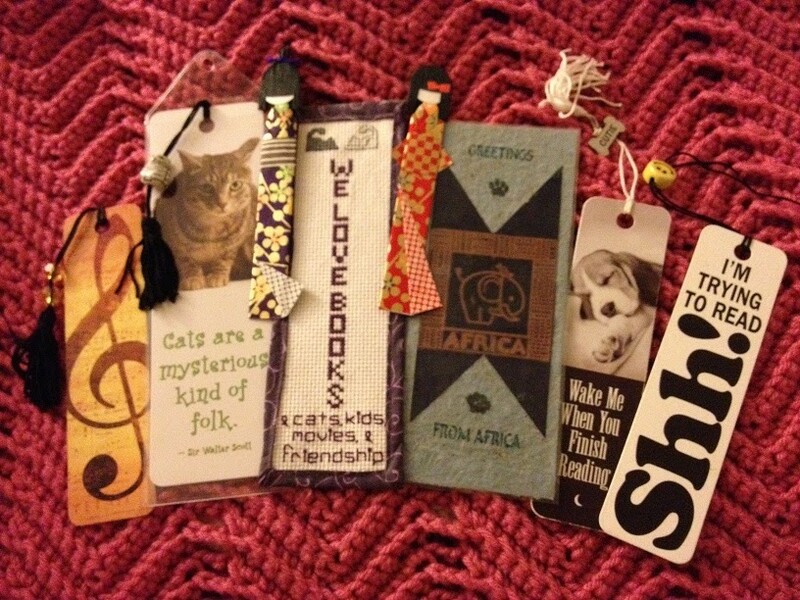 I love my bookmarks. I narrowed down my collection a few years ago, but I still have quite a few. I rotate them out now and then so they all get used. 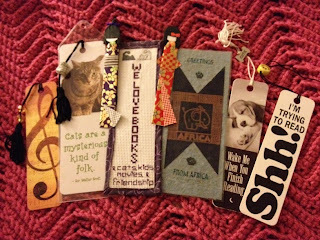 I love your bookmarks :) My youngest daughter recently made me some and they are my current favorites! I'm reading Sisterland by Curtis Sittenfeld. It's quite good! I look forward to your review of Sisterland when you finish it! I would keep reading. I've stalled on War and Peace too, right in the middle, but I will get back to it sometime! I haven't read anything by Wally Lamb since She's Come Undone. The Hour I First Believed sounds good so far from what you've said, so maybe I should change that! I read War and Peace one summer in university when I had more time and some parts are definitely a slog. I hope you persevere, though, I think it's worth it. Meghan - I really liked Wally Lamb's other books so am hoping this one will continue to be as good. Interesting to know more about this one! Thanks for visiting and commenting on my blog (Rabid Bookworm). Rabid Bookworm - The mystery isn't quite what I expected, but I am enjoying it so far. Just finished The Aviator's Wife and a mystery from my TBR stack, a Kate Shugak mystery, The Singing of the Dead, by Dana Stabenow. I left a bookmark in War and Peace a few years ago!! LOL!!! You have a lot of great books in the process. I'm listening to The Good House, participating in a RAL of The Wind-Up Bird Chronicle (loving it! ), and reading The One I Left Behind (gory and gruesome!!) Have a great week!! I've heard such good things about The Good House. I hope you are enjoying it! I had wanted to join you all for The Wind-Up Bird but knew one month wouldn't be enough for me, not with my other reading. :-( I'll get to it though! I hope you have a good week too! I have fun prowling around the read-a-thonners during my mini-challenge. Such a great reading event. Hard to participate with a toddler, but I'm hoping for fall!